On 13 December 1981 martial law was declared in Poland. Telephone lines were cut. Tanks enforced roadblocks. Police arrested and imprisoned thousands. The intention was to crush Solidarity, the independent trade union led by Lech Walesa. Solidarity offices in cities across the country were raided. The police seized records and equipment and posted guards. Most of the Solidarity leadership was arrested but some escaped capture and went into hiding. A life of conspiracy against the communist regime awaited them. Michael Kaufman arrived in Warsaw in 1984 as the correspondent for the New York Times. Two and a half years since the mass arrests had taken place. Most of those imprisoned had been released but 700 leading opposition figures remained in jail. Lech Walesa was freed but kept under constant surveillance. Solidarity activists who escaped capture had organised clandestine networks. These networks were involved in a number of activities. Printing illegal newspapers, magazines and books. Broadcasting on portable radio transmitters. Collecting money for the underground. Micahael Kaufman met regularly with his kolporter (bootlegger of illicit publications). He never knew his real name. One of the illegal publications was called The Small Conspirator. This was a guide on how to carry out clandestine activity. 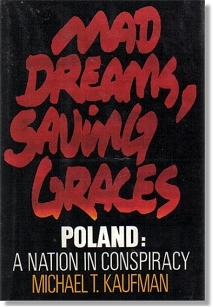 This guide and similar publications evoked the memory and exploits of previous Polish conspiraces: anti-czarist uprisings of the 19th Century, the Warsaw Uprising of 1944, etc. Michael Kaufman found that there was a constant awareness in Poland of history and tradition. Each year on 1 November, All Souls' Day, Poles gathered in cemeteries to lay flowers and light candles on graves. On the last Sunday of every month special masses were said for Poland at St. Stanislaw Kostka church in Warsaw. The church would be filled to capacity with three thousand inside and another ten to twelve thousand outside. They came to listen to the sermons of Father Jerzy Popieluszko. A 37 year old priest who was closely identified with Solidarity. In 1979 striking steelworkers had asked Father Popieluszko to serve mass at their Warsaw foundry. They made him their patron. Coal miners, doctors and nurses, actors all sought him out. His sermons at St. Stanislaw Kostka had become a symbol of national resistance to the communist regime. Michael Kaufman often took foreign visitors to St. Stanislaw Kostka to hear him preach. On the morning of 20 October 1984 Father Popieluszko did not arrive at the St. Stanislaw Kostka church to conduct the early morning mass. The previous night he had preached at a church in Bydgoszcz, 120 miles northwest of Warsaw. Fellow priests at St. Stanislaw Kostka contacted Bydgoszcz and learned that he had left for Warsaw after dinner with his driver. The worried priests called the episcopate and the police. By the afternoon police in Torun had found the driver. He told how he and Father Popieluszko had been abducted by three men but that he (the driver) had escaped. On 30 October the police found the body of Father Popieluszko. He had been murdered by policemen. Prominent Solidarity activists accused the General Jaruzelski government of creating the "basis and climate" for the killing. Nearly 500,000 people attended the funeral at St. Stanislaw Kostka church. One of the eulogies at the service was given by Karol Szadurski, a mill hand who worked with Father Popieluszko. In the spring of 1988 a wave of strikes spread through Poland. The cry of Solidarity was heard once again. The strikes peetered out but in September a more serious round of strikes began. In 1989 communism in Poland collapsed. Publisher - Published by Random House, in 1989. Video interview with Michael Kaufman in which he discusses his experiences of Poland. BookNotes (US), July 1989. This page was added on 09 July 2011.